Live Jazz has once again returned to T. Murray’s on South High Street, the building which once housed the Barrister Hall jazz club. 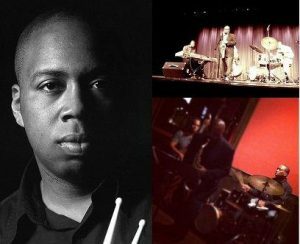 T. Murray’s will be showcasing the jazz talents of drummer James Gaiters and his Quartet which includes Eddie Bayard on Saxophone, Hamilton Hardin on Piano and various bass players that will sit in during this tenure. Show times are every Friday evening starting at 9pm until Midnight. T. Murray’s is located at 560 S High St, next to the High Beck tavern. James Gaiters, Jr. was born in 1968 in Columbus, Ohio and began to play drums at the age of four, influenced by his mother who was a concert pianist and also the church organist for his father who is a pastor. During his youth, James played in various school and local bands, studying many styles of music. He then went on to college to study architecture. Musically, this move proved to be the best move of his swiftly growing career. In late 1994, James began playing in the Ohio State University Jazz Ensemble, and later met Edwin Bayard, a student, and also tenor saxophone player at Ohio State University. This proved to be the launching pad for one of the greatest musical unions. His first major break onto the circuit was to join up with jazz trumpeter, and MoJazz recording artist, Pharez Whitted with whom he has toured the country extensively. James has been a featured performer with Wynton Marsalis at New York’s world renowned Village Vanguard, and was featured on a world tour with RCA/Victor recording artist D. D. Jackson.